This isn't going to be a full DIY because veedoubleme already did a hell of a walkthrough and I essentially copied his. I just completed my install this weekend and thought I'd offer my tips. I want to start by showing my appreciation to Nik with uberstealth audio as well as veedoubleme for his amazing DIY. Nik got me my box in a little over a week! He is wanting to start coating his boxes with a rubbery plastic similar to a rhino trunk liner as opposed to carpet covered (correct me if I am wrong Nik). I prefer the new coating to carpet. The coating you can tell is very durable. It smelled a bit funky when I got it, but went away soon enough. Looks great, fits perfect, sounds gorgeous... Can't complain in the slightest. Absolutely worth every penny. First thing that differed from other installs that I have seen is where they punch through the firewall for the power cable to the battery. Most people have a foam cover over a rubber gromet that they just pull out poke a hole through and go. I THINK that this is where our clutch pedals go in manuals. So after spending some time trying to find that damn cover I realized I didn't have one. Anyways, there is a thick bundle of cables up higher and to the left of the clutch pedal that goes through into the engine bay and drops out almost directly behind the fuse box (and below it). To use this you'll have to take out the battery (I will be posting another thread shortly explaining some things I found about leaving the battery unplugged for too long). There are open slots in the fuse box that you can land the cable on. I went with slot C or D... I can't remember. But it is an 80 amp fuse spot. I figure i'd rather have my inline fuse (50A) that came with my Scosche amp kit to blow before I start taking out the fuses that came with the car. Trim pieces you really do just have to pull hard and straight up. All but 2 of my clips stayed in the frame of the body and had to be pulled out and replaced in the trim pieces. None broke. The back seat... I didn't fully remove it because I had read all over the forums that getting it back in was a PITA. I removed the two front clips first and was able to lift it up enough. From the trunk side you can stick a hanger or something though and under the seat. Just loop your speaker and power cables through the hangar and pull them into the trunk... Similar to what you will have to do with the amp power cable through the firewall. For all wiring information i'll refer you to veedoubleme's DIY because it was all spot on and saved me a TON of time. Now for my amp/L2Ci mounting. I cut a 1/2" piece of MDF to go directly under the right side foam piece to raise it up high enough to match the height of the sub box (just like veedoubleme). I kept the entire cubby in the foam though. I initially planned to chop of that section, but I thought that it would lose a lot of support for the trunk mat, as well as require more work adding in supports to hold up the corner. I ended up cutting a piece of the scrap MDF to match the shape of that cubby hole exactly, and i placed it in the "floor" of the cubby so I could screw the hardware to the board instead of the foam. But to account for how wide the amp was, I knocked out part of the foam wall (closest to the tire) so that the amp could fit and still have MDF to rest on. After that I punched a hole in the right side wall so that I could run my wires to/from the amp/LC2i. That's all I have though. Hopefully this will help some people out there. If anyone cares to see more pictures let me know and I can go snap some. I would have got one of where I brought the power cable through the firewall, but it's raining here now. Also if the amp mounting section was unclear let me know and I can try to give a better explanation/send more pics of it but hopefully the one attached helps. Update: I forgot to mention one thing I messed up on during my install. I didn't want to remove the dead pedal or the trim around the hood release lever so I just dropped the cable down and went under the driver door sill trim. In retrospect that trim around the hood release lever is pretty loose/open up near the top. It is very possible to weed the power cable down through that and out the bottom before entering the door sill trim. By the time I noticed this I already had the cable in the trunk and was popping trim back in... Needless to say; I have yet to fix it. If you're talking about the open bolts next to where the battery line connects to the fuse box (metal rail), then you may want to put a fuse inline. I'm pretty sure that 80A is the maximum current draw on that mount point, not the fused current. When I looked at mine, the battery line from the battery to that metal rail did not appear fused anywhere (just a flat metal bar), so you have a straight run from the battery back to your amp. Any shorts or pinched wires could start a fire in your car. This was my observation as well. 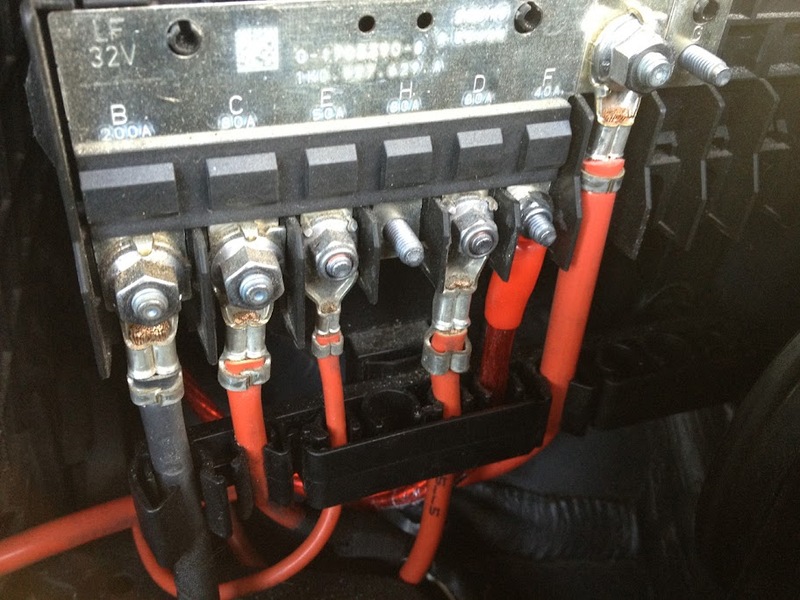 Never use a fuse connection in the car, regardless if it's being used to run other equipment. An inline fuse/breaker within 12" of the battery connection point is RECOMMENDED. The open bolt I used was the one on the far right, labeled "G" . It is directly inline with the battery cable. I mounted the fuse holder right in front of the battery (via bent "L" bracket) on the battery tray itself. I do have an inline fuse as well (50A). It came with the power cable in my amp wiring kit. So it will blow before the line current exceeds what my mounting slot is rated for (80A). Thanks for the clarification on what the amperage ratings on the mount points are. nvturbo, my mount point looked like slot "H" in the picture; no cables were attached to that mount point, but it was rated for 80A (can't read what H is rated for). So you think that slot G should be used since it is directly in line with the battery cable itself? After a few months, my carpet is not sticking anymore on one side, so I think it's good that he's updating it. I have the same sub as you, 2ohm Pioneer. Good stuff. Box is great, sounds nice, invisible. One thing of note, I had to do a little work to the floor since the box is a bit taller than the spare tire and right side foam insert. The deck liner won't sit straight from this misalignment, and it was driving me nuts. Correct, the box is about 1/2" higher than the right side foam. This is why I cut the 1/2" MDF board to place under that piece of foam. It will raise it high enough to match the height of the box. As for the sag in the center above the spare tire, i've seen people add mounts to the spindle that goes through the center of the spare tire. I just cut the scrap MDF I had into a giant semicircle and threw it on top of the spare tire itself. Doesn't look as clean probably, but it's super easy to remove if I need to get at the spare tire. I just feel more comfortable using that point because there's no relay or components connected to it making troubleshooting easier. It's basically the same as connecting to the positive (+) of the battery terminal if you want to look it that way. Nik, have you ever tried or considered using contact cement instead of spray adhesive? Nik: Less posting, more boxing. Very true. I may move mine over next time I'm tinkering under the hood. GS, did you order a box as well? You'll have to let me know how you go about adding polyfill. I added about 7.5 oz to mine and I have no complaints with how it sounds. Just curious how others are going about it. I did. I'll let you know when it gets here and I get it setup. dcpppf: Great wright up! I am about 3/4 the way through my exact same build, I just found your post after a similar eye-opening experience when I realized I didnt have a rubber cover I could just pop off and stick the main power wire through. Could you post a couple pictures of your power wire going through the firewall? One more question, do you think I will be ok running my 16.5 ft power wire along the passenger side?